Supercomputing youngster SiCortex has done the inevitable by popping out a pint-sized version of its cluster in a container. The new SC072 - code-named "Catapult" - fits 72 processors into a deskside unit that starts at less than $15,000. The system is a no brainer for SiCortex since it provides a more a digestible option for engineers, developers and those hoping to take the company's weird hardware for a test drive. In addition, the more compact unit lets SiCortex tap into a trend pioneered by now deceased Orion Multisystems of selling supercomputer class machines in a near PC form factor. 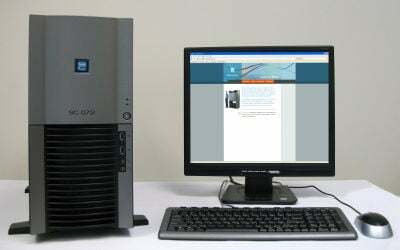 To date, SiCortex has shipped 5,832 and 648 processor machines. These cabinet-sized systems run on slow, power-friendly MIPS cores. This lets SiCortex pack a lot of horsepower in a relatively small amount of space, while keeping energy consumption low. The company has also focused on maintaining high internal bandwidth between all of the cores. "SiCortex has introduced a new concept in high-performance computing by implementing a complete cluster node on a chip, including six 64-bit processors, multiple memory controllers, a high-performance cluster interconnect and a PCIexpress connection to storage and internetworking," the company said. "With a total of 72 processors, 48 GB memory, and 3 PCIexpress ports, the Catapult draws less than 200 watts of power and fits in standard PC chassis. This eliminates the heat and fan noise issues that have previously made it impossible to put such a large cluster in a deskside environment." The system also has an Opteron node inside it for easy access to the x86 world.